Meagre, Argyrosomus regius (Asso 1801) is an important alternative species in aquaculture. The in vitro assay provides practical assessments for the evaluation of feed ingredients. In this study, the inhibition degrees of feed ingredients (fish meal-FM, fish hydrolysate-FH, krill meal-KM, soybean meal-SM, wheat gluten-WG, corn gluten-CG and sunflower meal-SF) on protease activities of meagre larvae were determined. Larvae were sampled from the first day of opening the mouth (3 days after hatching-DAH) until the end of the weaning (32 DAH) from the Egemar Hatchery (Aydın-Turkey). Larvae of the total length were measured as 3.19 ±0.02-21.61 ±0.22 mm and weights were calculated as 0.53 ±0.02-118.00 ±1.09 mg at 3 and 32 DAH, respectively. Protease activities of larvae were the lowest as 5.95 ±0.60 U/mg protein (15 DAH) and the highest as 211.21 ±12.56 U/mg protein (7 DAH), respectively (P<0.05). The lowest inhibitions degrees of feed ingredients were observed at 15 DAH except for SF. The use of FH in the diet formulations of meagre larvae should be paid attention. While CG and SF are advised, SM does not seem to be suitable. Alarcón, F.J., Díaz, M., Moyano, F.J. (1997). Feeding tomorrow's fish. In A.G.J. Tacon & B. Basurco (Eds. ), Studies of digestive enzymes in fish: Characterization and practical applications (p. 113-121). Zaragoza Mazarrón, Spain: CHIEM-Cahiers Options Meditérranéennes n.22. Alarcón, F.J., Moyano, F.J.M., Díaz, M., Fernández-Díaz, C., Yúfera, M. (1999). Optimization of the protein fraction of microcapsules used in feeding of marine fish larvae using in vitro digestibility techniques. Aquaculture Nutrition, 5(2), 107-113. Ali, H., Haque, M.M., Chowdhury, M.M.R., Shariful, M.I. (2009). In vitro protein digestibility of different feed ingredients in Thai koi (Anabas testudineus). Journal of the Bangladesh Agricultural University, 7(1), 205-210. Arda, G. (2011). Sarıağız (Argyrosomus regius) larvalarında gastrointestinal tüpün histolojik gelişimi. MSc Thesis: Ege Üniversitesi, Fen Bilimleri Enstitüsü, İzmir. Bestin, A., Dupont-Nivet, M., Médale, F., Quillet, E., Vandeputte, M., Cariou, S., Desgranges, A., Laureau, S., Ricoux R., Beutin, C., Haffray, P. (2014). Comparative additive genetic basis of high feed substitution by plant ingredients in four major fish species farmed in temperate and Southern Europe. Aquaculture Europe 14, Donostia-San Sebastián, Spain, 14-17 Oct 2014, pp. 136-137. Bodur, T., Günaydın, C.O., Toplu, S. (2014). A preliminary research on Meagre (Argyrosomus regius, Asso 1801) culture in earthen pond during summer season in Turkey. Aquaculture Europe 14, Donostia-San Sebastián, Spain, 14-17 Oct 2014, pp. 150-151. Bradford, M.M. (1976). A rapid sensitive method for the quantification of microgram quantities of protein utilizing the principle of protein-dye binding. Analytical Biochemistry, 72(1-2), 248-254. Cahu, C.L., Zambonino Infante J.L. (1994). Early weaning of sea bass (Dicentrarchus labrax) larvae with a compound diet: effect on digestive enzymes. Comparative Biochemistry and Physiology Part A: Physiology, 109(2), 213-222. Cara, J.B., Moyano, F.J., Cárdenas, S., Fernández-Díaz, C., Yúfera, M. (2003). Assessment of digestive enzyme activities during larval development of white bream. Journal of Fish Biolgy, 63(1), 48-58. Campoverde, C., Estevez, A. (2017). The effect of live food enrichment with docosahexaenoic acid (22:6n-3) rich emulsions on growth, survival and fatty acid composition of meagre (Argyrosomus regius) larvae. Aquaculture, 478, 16-24. Candeias-Mendes, A., Castanho, S., Ribeiro, L., Conceição, L.E.C., Dias, J., Costa, S., Bandarra, N.M., Pousão-Ferreira, P. (2015,). Melhoramento do cultivo larvar de corvina, Argyrosomus regius. XV Congreso Nacional y ı Congreso Ibérico de Acuicultura, Huelva, España 13-16 Oct 2015, pp. 536-537. De Francesco, M., Parisi, G., Pérez-Sánchez, J., Gómez-Réqueni, P., Médale, F., Kaushik, S.J., Mecatti, M., Poli, B.M. (2007). Effect of high-level fish meal replacement by plant proteins in gilthead sea bream (Sparus aurata) on growth and body/fillet quality traits. Aquaculture Nutritional, 13(5), 361-372. Dias, J., Ribeiro, L., Soares, F., Barata, M., Bandarra, N., Rodrigues, V., Colen, R., Amoedo, A., Moura, J., Fernandes, J., Narciso, L., Cunha, M., Conceição, L., Pousão Ferrera, P. (2014). Nutritional basis of meagre (Argyrosomus regius) a candidate species for mass production in the mediterranean. Aquaculture Europe 14, Donostia-San Sebastián, Spain, 14-17 Oct 2014, pp. 327-328. Diken, G., Demir, O., Naz, M. (2016a). The potential effects of commercial feeding protocol on protease activities and cortisol stress responses of meagre (Argyrosomus regius). Agriculture&Food, 4, 460-472. Diken, G., Demir, O., Naz, M. (2016b). The potential inhibitory effects of microalgae and macroalgae on protease activities of Argyrosomus regius (Pisces, Scianidae) larvae using in vitro assays. Agriculture&Food, 4, 473-483. Diken, G., Demir, O., Naz, M. (2016c). The inhibition effects of different protein sources on protease activities of meagre larvae (Argyrosomus regius Asso, 1801). FABA 2016, 3-5 Nov 2016, Antalya, Turkey, pp. 85. Diken, G., Demir, O., Naz, M. (2017). Determination of the inhibitory effects of microdiets used in routine commercial feeding protocols on protease activities of Argyrosomus regius (Asso, 1801) larva. Iranian Journal of Fisheries Sciences, 16(1), 96-107. Diken, G., Demir, O., Naz, M. (2018). The inhibitory effects of different diets on the protease activities of Argyrosomus regius (Pisces, Scianidae) larvae as a potential candidate species. Journal of Applied Animal Research, 46(1), 94-99. Dimes, L.E., Haard, N.F. (1994). Estimation of protein digestibility, I. development of an in vitro method for estimating protein digestibility of salmonids. Comparative Biochemistry and Physiology Part A: Physiology, 108(2-3), 349-362. Duncan, N., Myrseth, B. (2011). European Aquaculture Socitey Web. New species for aquaculture production including ornamentals. Retrieved December 20, 2015, from http://www.aquaeas.eu/images/stories/Meetings/AE2011/New_species_Duncan.pdf (accessed 03.01.19). Eid, A.E., Matty, A.J. (1989). A simple in vitro method for measuring protein digestibility. Aquaculture, 79, 111-119. El-Shebly, A.A., El-Kady, M.A.H., Hussin, A.B., & Hossain, Md.Y. (2007). Preliminary observations on the pond culture of meagre Argyrosomus regius (Asso, 1801) (Sciaenidae) in Egypt. Journal of Fisheries and Aquatic Science, 2(5), 345-352. Estevéz, A., Treviño, L,, Kotzamanis, Y., Karacostas, I., Tort, L., Gisbert, E. (2011). Effects of different levels of plant proteins on the ongrowing of meagre (Argyrosomus regius) juveniles at low temperatures. Aquaculture Nutritional, 17(2), e572-e582. Ezquerra, J.M., García-Carreño, F.L., Civera, R., Haard, N.F. (1997). pH-stat method to predict protein digestibility in white shrimp (Penaeus vannamei). Aquaculture, 157(3-4), 251-262. Ezquerra, J.M., García-Carreño, F.L., Carrillo, O. (1998). In vitro digestibility of dietary protein sources for white shrimp (Penaeus vannamei). Aquaculture, 163(1-2), 123-136. Federation of European Aquaculture Producers-FEAP. (European Aquaculture Production Report 2008-2016). Retrieved June 26, 2018 from http://blancchamp.be/wp-content/uploads/2018/05/production-report-2017_web.pdf (accessed 03.01.19). Fernández-Palacios, H., Schuchardt, D., Roo, J., Borrero, C., Hernández-Cruz, C.M., Socorro, J. (2007). Estudio morfométrico de la corvina (Argyrosomus regius Asso, 1801) durante el primer mes de vida. XI Congreso Nacional de Acuicultura, Vigo, Española, 24-28 Sept 2007, pp. 755-758. Gamsız, K., Neke, M. (2008). Embryonic development stages of meagre Argyrosomus regius Asso 1801 under rearing conditions. 8th Larval Biology Symposium, Lisbon, Portugal, 6-11 July 2008, poster session. García-Carreño, F.L. (1996). Proteinase inhibitors. Trends in Food Science and Technology, 7(6), 197-204. García Mesa, S., Suárez, M.D., Rincón Cervera, M.A., Guil Guerrero, J.L., González, G., Cárdenas, S., García Gallego, M. (2014). Time course of muscle fatty acid composition of cultured meagre (Argyrosomus regius) during the first sixteen months of a cage culture. Grasas Aceites, 65(1), e006. García-Ortega, A., Koussoulaki, A., Boer, H., Verreth, J. (2000). In vitro protein digestibility of artemia decapsulated cysts and nauplii, and of microbound diets for larval fish. Aquaculture Research, 31(5), 475-477. Gil Oviedo, M.M. (2013). Recovery of meagre (Argyrosomus regius) population in the Balearic Coastal ecosystem (Western Mediterranean). PhD Thesis: University of the Balearic Islands, Palma. Haffray. P., Malha, R., Sidi, M.O.T., Prista, N., Hassan, M., Castelnaud, G., Karahan-Nomm, B., Gamsız, K., Sadek, S., Bruant, J-S., Balma, P., Bonhomme, F. (2012). Very high genetic fragmentation in a large marine fish, the meagre Argyrosomus regius (Sciaenidae, Perciformes): Impact of reproductive migration, oceanographic barriers and ecological factors. Aquatic Living Resources, 25(2), 173-183. Haközü, G. (2014). Çipura (Sparus aurata, Linneaus 1758) larvalarının kortizol seviyeleri üzerine ticari besleme prosedürünün etkileri. MSc Thesis: Mustafa Kemal Üniversitesi, Fen Bilimleri Enstitüsü, Hatay. Holt, G.J., Webb, K.A., Rust, M.B. (2011). Larval fish nutrition. In: G.J. Holt (Ed. ), Microparticule diets: testing and evaluating success, (p. 353-372). Chichester, UK: John Wiley & Sons Inc. ISBN: 978-0-8138-1792-7. Kaushik, S.J., Cravedi, J.P., Lalles, J.P., Sumpter, J., Fauconneau, B., Laroche, M. (1995). Partial or total replacement of fish meal by soybean protein on growth, protein utilization, potential estrogenic or antigenic effects, cholesterolemia and fresh quality in rainbow trout, Oncorhynchus mykiss. Aquaculture, 133, 257-274. Kaushik, S. J., Covès, D., Dutto, G., Blanc, D. (2004). Almost total replacement of fishmeal by plant protein sources in the diet of a marine teleost, the European seabass, Dicentrarchus labrax. Aquaculture, 230, 391-404. Kolkovski, S., Tandler, A. (2000). The use of squid protein hydrolysate as a protein source in microdiets for gilthead seabream Sparus aurata larvae. Aquaculture Nutritional, 6(1), 11-15. Kolkovski, S., Czesny, S., Dabrowski, K. (2000). Use of krill hydrolysate as a feed attractant for fish larvae and juveniles. Journal of the World Aquaculture Society, 31(1), 81-88. Kissil, G.W., Lupatsch, I. (2004). Successful replacement of fishmeal by plant proteins in diets for the gilthead seabream, Sparus aurata L. The Israeli journal of aquaculture-Bamidgeh, 56(3), 188-199. Krogdahl, Å., Bakke-McKellep, A. M., Baevefjordi, G. (2003). Effects of graded levels of standard soybean meal on intestinal structure, mucosal enzyme activities, and pancreatic response in Atlantic salmon (Salmo salar L.). Aquaculture Nutritional, 9(6), 361-371. Kružić, N., Mustać, B., Župan, I., Čolak, S., 2016. Meagre (Argyrosomus regius Asso, 1801) aquaculture in Croatia. Croatian Journal of Fisheries, 74, 14-19. Kuzu, E., Naz, M. (2012). Çipura (Sparus aurata L., 1758) larvalarında proteaz aktiviteleri üzerine farklı protein kaynaklarının inhibisyon etkileri. FABA 2012, 21-24 Nov Eskişehir, Turkey, pp. 33. Monfort, M.C. (2010). Present Market Situation and prospects of Meagre (Argyrosomus regius), as an emerging species in Mediterranean Aquaculture. Rome, Italy: FAO. ISBN: 978-92-5-106605-8. Moyano, F.J., Díaz, M., Alarcón, F.J., Sarasquete, M.C. (1996). Characterisation of digestive enzyme activity during larval development of gilthead seabream (Sparus aurata). Fish Physiology and Biochemistry, 15(2), 121-130. Moyano, F.J., Alarcón, F.J., Díaz, M. (1998). Comparative biochemistry of fish digestive proteases applied to the development of in vitro digestibility assays. Trends in Comparative Biochemistry and Physiology, 5, 136-143. Moyano López, F.J., Martínez Díaz, I., Díaz López, M., & Alarcón López, F.J. (1999). Inhibition of digestive proteases by vegetable meals in three species (Sparus aurata), tilapia (Oreochromis niloticus) and African sole (Solea senegalensis). Comparative Biochemistry and Physiology Part B: Biochemistry and Molecular Biology, 122(3), 327-332. Moyano, F.J., Barros, A.M., Prieto, A., Cañavate, J.P., Cárdenas, S. (2005). Evaluación de la ontogenia de enzimas digestivas en larvas de hurta, Pagrus auriga (Pisces: Sparidae). Revista AquaTIC, 22, 39-47. Moyano, F., Saénz de Rodrigáñez, M.A., Díaz, M., Tacon, A.G.J. (2015). Application of in vitro digestibility methods in aquaculture: constraints and perspectives. 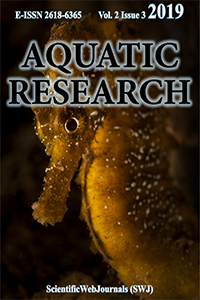 Reviews in Aquaculture, 7(4), 223-242. Naz, M., Yúfera, M. (2012). The potential ınhibitory effects of the commercial diets on protease activities of larvae and live foods. Journal of FisheriesSciences.com, 6(3), 224-231. Papadakis, I.E., Kentouri, M., Divanach, P., Mylonas, C.C. (2013). Ontogeny of the digestive system of meagre Argyrosomus regius reared in a mesocosm, and quantitative changes of lipids in the liver from hatching to juvenile. Aquaculture, 388-391, 76-88. Parisi, G., Terova, G., Gasco, L., Piccolo, G., Roncarati, A., Moretti, V.M., Centoducati, G., Gatta, P.P., Pais, A. (2014). Current status and future perspectives of Italian finfish aquaculture. Reviews in Fish Biology and Fisheries, 24(1), 15-73. Person-Le Ruyet, J., Bergot, P. (2001). Nutrition and feeding of fish and crustaceans. In: J. Guillaume & S. Kaushik & P. Bergot & R. Métailler (Eds. ), Artificial food for fish larvae (p. 229-238). Chichester, UK: Praxis Publishing Ltd. ISBN: 978-1-85233-241-9. Ribeiro, L., Zambonino-Infante, J.L., Cahu, C., Dinis, M.T. (1999). Development of digestive enzymes in larvae of Solea senegalensis, Kaup 1858. Aquaculture, 179, 465-473. Ribeiro, L., Moura, J., Santos, M., Colen, R., Rodrigues, V., Bandarra, N., Soares, F., Ramalho, P., Barata, M., Moura, P., Pousão-Ferreira, P., Dias, J. (2015). Effect of vegetable based diets on growth, intestinal morphology, activity of intestinal enzymes and haematological stress indicators in meagre (Argyrosomus regius). Aquaculture, 447, 116-128. Rodehutscord, M., Mandel, S., Pack, M., Jacobs, S., Pfeffer, E. (1995). Free amino acids can replace protein-bound amino acids in test diets for studies in rainbow trout (Oncorhynchus mykiss). Journal of Nutrition, 125(4), 956-963. Roo, J., Hernández-Cruz, C.M., Borrero, C., Schuchardt, D., Fernández-Palacios, H. (2010) Effect of larval density and feeding sequence an meagre (Argyrosomus regius; Asso, 1801) larval rearing. Aquaculture, 302, 82-88. Schiavone, R., Zilli, L., Storelli, C., Vilella, S. (2012). Changes in hormonal profile, gonads and sperm quality of Argyrosomus regius (Pisces, Scianidae) during the first sexual differentiation and maturation. Theriogenology, 77, 888-898. Saavedra, M., Grade, A., Candeias-Mendes, A., Pereiraa, T.G., Teixeiraa, B., Yúfera, M., Conceiçãoc, L.E.C., Mendesa, R., Pousão-Ferreira, P. (2016). Different dietary protein levels affect meagre (Argyrosomus regius) larval survival and muscle cellularity. Aquaculture, 450, 89-94. SPSS Inc. (2015). SPSS for IBM Version 23.0. Chicago, IL, USA. Solovyev, M.M., Campoverde, C., Öztürk, S., Moreira, C., Diaz, M., Moyano, F.J., Estévez, A., Gisbert, E. (2016). Morphological and functional description of the development of the digestive system in meagre (Argyrosomus regius): An integrative approach. Aquaculture, 464, 381-391. Southgate, P.C. (2012). Aquaculture farming aquatic animals and plant. In: J.S. Lucas & P.C. Southgate (Eds. ), Foods and feeding, (p. 188-213). Chichester, UK: A John Wiley & Sons Ltd. Publication. ISBN: 978-1-4051-8858-6. Süzer, C., Kamacı, H.O., Çoban, D., Yıldırım, Ş., Fırat, K., Saka, Ş. (2013). Functional changes in digestive enzyme activities of meagre (Argyrosomus regius; Asso, 1801) during early ontogeny. Fish Physiology and Biochemistry, 39(4), 967-977. Tacon, A.G.J. (1997). Feeding tomorrow's fish. In A.G.J. Tacon & B. Basurco (Eds. ), Fishmeal replacers: review of antinutrients within oilseeds and pulses. A limiting factor for the aquafeed green revolution? (p 153-182). Zaragoza, Mazarrón: CHIEM-Cahiers Options Meditérranéennes n:22. Vallés, R., Estévez, A. (2013). Light conditions for larval rearing of meagre (Argyrosomus regius). Aquaculture, 376-379, 15-19. Vallés, R., Estévez, A. (2015). Effect of different enrichment products rich in docosahexaenoic acid on growth and survival of meagre, Argyrosomus regius (Asso, 1801). Journal of the World Aquaculture Society, 46(2), 191-200. Vargas-Chacoff, L., Ruiz-Jarabo, I., Páscoa, I., Gonçalves, O., Mancera, J.M. (2014). Yearly growth and metabolic changes in earthen pond-cultured meagre Argyrosomus regius. Scientia Marina, 78(2), 193-202. Velazco-Vargas, J., Martínez-Llorens, S., Cerda, M.J., Tomás-Vidal, A. (2013). Evaluation of soybean meal as protein source for Argyrosomus regius (Asso, 1801) (Sciaenidae). International Journal of Fisheries and Aquaculture, 5(3), 35-44. Velazco-Vargas, J., Tomás-Vidal, A., Hamdan, M., Moyano López, F.J., Cerda, M.J., Martínez-Llorens, S. (2014). Influence of digestible protein levels on growth and feed utilization of juvenil meagre Argrysomus regius. Aquaculture Nutrition, 20(5), 520-531. Walter, H.E. (1984). Methods of enzymatic analysis. In: H.U. Bergmeyer, J. Bergmeyer, M. Graßl (Eds. ), Proteinases: methods with haemoglobin, casein and azocoll as substrates (p. 270-277). Weinheim, Florida: Verlag Chemie ISBN: 270-277; 3-527-26045-5. Whitehead, P.J.P., Bauchot, M.L., Hureau, J.C., Nielsen, J., Tortonese, E. (1986). Fishes of the North-Eastern Atlantic and the Mediterranean. Paris, France: UNESCO. ISBN: 978-0119111590. Yıldız, G., Ateş, G., Ünal, C., Kuzu, E., Naz, M. (2012). Levrek (Dicentrarchus labrax L., 1758) larvalarının proteaz aktiviteleri üzerine farklı protein kaynaklarının inhibisyon etkileri. FABA 2012, 21-24 Nov Eskişehir, Turkey, pp. 41. Yılmaz, E., Naz, M., Sayın, S., Töre, Y. (2012). Çipura (Sparus aurata L., 1758) larvalarının proteaz aktiviteleri üzerine Chlorella spp. ve Spirulina platensis’in inhibisyon etkileri. FABA 2012, 21-24 Nov Eskişehir, Turkey, pp. 87. Zambonino Infante, J.L., Cahu, C.L. (1994). Development and response to a diet change of some digestive enzymes in sea bass (Dicentrarchus labrax) larvae. Fish Physiology and Biochemistry, 12(5), 399-408. Zambonino Infante, J.L., Cahu, C.L. (2001). Ontogeny of the gastrointestinal tract of marine fish larvae. Comparative Biochemistry and Physiology Part C: Toxicology & Pharmacology, 130(4), 477-487.